Need an attractive smartwatches that you can wear to work and wear during your workouts? The TicWatch Pro is that watch. Don't need the sports stuff, but want a Wear OS watch with great battery life? TicWatch Pro is that watch too. It’s hard to think of many smartwatches at this price point that offer anything as complete. Wear OS, the former Google Android Wear wearable operating system, has gone through something of a shift over the past few years. As fewer traditional tech companies are building smartwatches, more designer watch brands are picking up the slack, which is where you're most likely to spot Google's presence. However, there are a couple of tech companies still building them, such as Mobvoi, which makes the affordable TicWatch line-up. Now, Mobvoi perhaps isn't that well known in the west at present, with its fairly basic sub-£200 TicWatch models not having the widest reach. But its TicWatch Pro is worthy of your attention. Promising incredible battery life, featuring an unusual dual-layer screen and all the bells and whistles you could want from a wearable device, does the Pro live up to its name? The TicWatch Pro is a clear departure from the more affordable and plasticky models in the line-up, instead using materials more suitable for a high-end smart sports watch design. With its stainless steel bezel and rear cover on the underside, the Pro is one sturdy and classy looking device - especially in its dark grey and black combination. This shiny bezel contrasts with the matte black finish of the case, giving it a stealthy appearance, which is further enhanced by the two minimally designed buttons on the right edge. On the underside of the watch the stainless steel cover houses precise cutouts for the tiny windows that allow the heart-rate monitor to work. There's also a small pill-shaped cutout for the 4-pin contact point, which is where the magnetic clip-on charging cradle connects. This charging cradle is something of a pleasant surprise. It's nice to have a cradle that clips on perfectly every time, thanks to a strong magnet and protruding guides that ensure it only fits one way. And because it's not a low-power Qi wireless base, it's not as slow to recharge as some others we've tested in recent times. Another element we really appreciate is the choice of strap design and materials. It's predominantly made from silicone, making it comfortable to wear, but it's covered in a thin layer of Italian leather, so is versatile for smart clothes or sports clothes. If you happen to not like the strap then you can easily switch it out for another standard 22mm quick-release one. In addition, the watch case itself is IP68 rated against water and dust ingress, so you can go running in the rain and it'll be just fine. Overall, the TicWatch Pro is comfortable and - although it may be quite large for some wrists (it's 12.6mm) - it's far from being the chunkiest smartwatch we've reviewed. Compared to the Casio WSD-F20, which has a similar dual-screen setup, it's positively slim. Dual screens: More than a gimmick? We've seen dual-layer screens before on smartwatches, such as that big outdoorsy Casio watch. The theory is that a secondary monochrome panel can show you the time constantly without using much battery. In the case of the TicWatch Pro, it kicks in automatically when the watch goes into standby after a few seconds of inactivity. As well as saving battery, it's also much easier to see in daylight. It's worth noting, however, that this monochrome panel isn't backlit, so you can't see it at night. But that's no real issue given you can summon the main OLED display with a simple wrist motion or by tapping on the screen, which brings with it illumination. As smartwatch displays go this 1.3-inch OLED panel is as good as what you'll find on its competitors. Its 400 x 400 resolution doesn't sound like much, but it's pretty standard these days and actually ensures a good level of detail and sharpness at arm's length. If there's any criticism, it's that it's difficult to see in bright daylight, even with the brightness increased to its maximum level. In regular Wear OS mode, you can interact with Android notifications, download and launch smart watch apps, customise your watch faces and so on using the power of touch. The touchscreen part of the experience is identical to pretty much every other Wear OS watch out there, although there's no rotational crown here for control, just those additional buttons. Despite not having a battery too dissimilar in capacity to many other Google-powered watches, the difference in battery life from the TicWatch Pro is remarkable. Used as our day-to-day smartwatch, including our daily 30 minute workouts, we managed to comfortably get through between four and five days use from a single full charge. That's double what most other Wear OS watches will offer, which largely comes down to the presence of that low-power secondary monochrome screen. What's more, with a full recharge time of around 90 minutes, it takes about half the time to refill it than the wireless charging types from Skagen, Fossil and Diesel. The TicWatch also has an Essential Mode, which basically shuts off all the smart Wear OS-powered elements, leaving only the monochrome display active. Using this mode exclusively, Mobvoi claims the Pro can last up to 30 days between charges. It's not really designed for that though, it's for the rare occasion you almost run out of battery and still want to be able to tell the time. This mode is slow to load, too, so avoid it unless absolutely necessary. One thing we can't help wondering is how much better the battery life could be if Qualcomm had updated its Wear OS watch processor. The 2100 chipset used inside the TicWatch is the same as can be found in nearly every Wear OS watch over the past few years, and hasn't been updated since 2016. It's due to be updated by the end of 2018, but that's no help to the TicWatch Pro. If you've ever used an Android Wear of Wear OS smartwatch then the TicWatch will feel right at home on your wrist. As with all these watches it's a case of six of one half a dozen of the other: i.e. their performance is one and the same. That means relative speediness, with some minor delays (pressing the fitness button to launch a session generally takes a few seconds to launch the fitness app, for example). Wireless connectivity has proven solid during our use, although you'll need a phone or network as there's no 4G/LTE on board the watch itself. We never got the dreaded "disconnected from phone" icon on screen, which has happened with some competitiors. 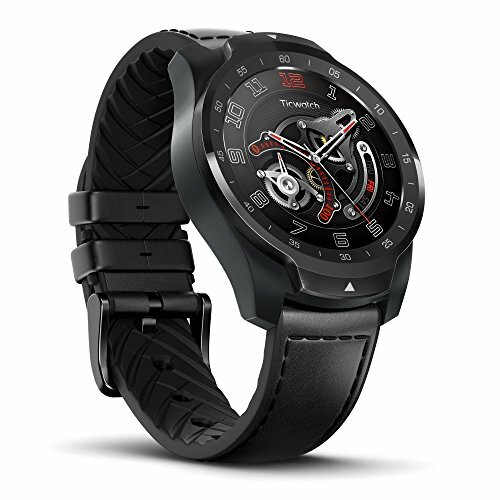 As this is a Google system, the TicWatch Pro is targeted at Android phone users. It is compatible with iPhone, too, but you won't get the same ability to reply to messages and email from your wrist. The TicWatch Pro isn't a dedicated sports watch per se, but it's not far off: tracking our running and kettlebell HIIT sessions has delivered enough accurate information for everyday use. We tested it on a couple of 30 minute runs and a 25 kettlebell sessions and, compared to the Garmin Vivoactive 3 (which we used on the same sessions for review purposes, not because we like to wear dozens of wearables at once), it performed as well. It also takes the TicWatch some time to lock onto a GPS signal, over a minute. That's seen us standing around waiting on the signal before going for a run. Once connected, however, it stays strong. Results do differ though. As a comparison: the TicWatch added 50 metres to a 4km run compared to the Garmin. So either Garmin is a little stingy with measurements, or its competition just isn't as accurate. As for heart-rate monitoring, the TicWatch Pro did a much better job than the Garmin has done for the last few months. Our HIIT kettlebell workouts with wrist-worn devices normally means really inconsistent data, as it's a hard activity to monitor, but the Pro painted a better overall picture than the Vivoactive. The only real downside of the Pro's health tracking ability is Mobvoi's smartphone app. The user interface doesn't make it clear how to view your fitness tracking data, for example, so we had to go digging around various cards to find our individual recordings. Once accessed we could see overall stats, a map of our routes and graphs showing both cadence and heart rate. It's all the basic information, it just needs a better layout, as calories burned and distance are hidden through yet more layers rather than being visible on the main screen. Sadly, the app also doesn't allow you to sync with third-party apps. That means no Strava, which is annoying. But you can just download and install the Strava Wear OS app from the Play Store if that's crucial to you. Need an attractive smartwatch that you can wear to work and wear during your workouts? The TicWatch Pro is that watch. Don't need the sports stuff, but want a Wear OS watch with great battery life? TicWatch Pro is that watch too. Sure, Mobvoi could build a more in-depth fitness-tracking app with a better user interface for the more serious sports people out there, but for most users its sporting capabilities will be ample. The TicWatch Pro is a reliable, practical and durable smartwatch that will survive your daily grind, won't give you battery anxiety, and doesn't depend on a big brand name to sell itself. No, this smartwatch sells itself by being smartly priced and specified with a genuinely useful dual-layer screen. The Huawei Watch 2 is something of a surprise package: great for on-the-go independent control without a phone thanks to (optional) 4G, well built and full of top-spec hardware and features. This Huawei watch costs more than the TicWatch Pro, though. Where the Samsung smartwatches succeed is in their user interface. Samsung's own wearable operating system is simply more attractive and intuitive than Google Wear OS. Plus there's the added convenience of the rotating bezel that acts as a scroll wheel of sorts. Again, however, Samsung can't match the TicWatch Pro on price.